Prince of Persia is the first game I played on a PC. It was a memorable experience, which I occasionally relive via either DOSBox or an old computer. 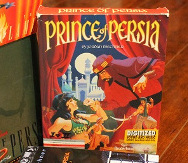 I played through the entire Prince of Persia for IBM PC (running in MSDOS 6.00). I saved the princess in just under 40 minutes. I think playthroughs should feel as if you were sitting next to a friend who was playing the game. You can hear the computer fans, the keyboard noise.